For boys, teens and men who play baseball, sliding shorts with cup attachments is pretty much an integral part of the uniform. Although they’re not absolutely mandated by the rules like helmets are, they’re still so useful that you really need to wear them when you play. Honestly, I played while wearing some sort of sliding pants with cup every single season. I was not comfortable playing unless I was wearing that. I wore one of these each season. Why Do You Need a Pair of Sliding Shorts With Cup? The main reason for using baseball sliding shorts with cup is that it can prevent you from getting scrapes and bruises on your legs and other parts when you slide. What’s more, when you wear a pair you feel protected and therefore more secure. You don’t hesitate to slide and that means you avoid late slides that actually increase the possibility of injury. You can either get the shorts and cup separate or you can get a pair of baseball sliding shorts with cup pocket. As a responsible shopper, you’ll obviously factor in the price when you make your final choice. Just don’t make it your only consideration, and that’s especially true for parents who are buying youth sliding shorts with cup for their son. The material. Affordable youth baseball sliding shorts with cup options are invariably made mostly from polyester, as this material is stretchy while also durable enough to provide some protection. Often there’s also some Spandex used to provide more stretch and a snug fit. Some even come with neoprene which is really tough yet elastic. Padding. While some may be okay with a plain pair of youth compression shorts with cup, for most boys it really helps if there’s some padding. This is especially useful when the padding is over the outside of the hips and thighs. But some may have padding in other areas, which is especially useful if you use several different types of slides. What About Fit and Moisture? The fit. You need to make sure that whichever option you go for has one in the size that really fits you. It shouldn’t be too tight so that you cut off circulation or chafe your skin. But it also shouldn’t be too loose that there are gaps between your skin and your shorts. Moisture management. There must be some way for the shorts to wick off the moisture so that you remain dry underneath. So now that we know what we should look for, where should we begin our search? Shock Doctor Men’s Power Compression Short with BioFlex Cup. It boasts a lot of hi-tech stuff, but they work quite well enough to justify the expense. These use “snug four-way stretch material” which is actually comfy, well-fitting due to the “flatlock seams” and can really wick the moisture away from the skin. For slide protection, there’s double layer compression over the thighs. It comes with the BioFlex Cup already attached, and this cup includes a “vented bio-shape body” What this means in simple terms is that “the boys” will be comfy inside the cup, and it won’t be too warm. For additional protection, the cup is also bolstered by a gel perimeter pad. To keep the cup in place, it also uses what it calls the X-pocket. The X-FIT cup retention system keeps it close to the family jewels sand also makes it feel more comfortable. Shock Doctor is a leading brand in the mouthguard, and with the Men’s Power Compression Short with BioFlex Cup they have extended their mission in providing other forms of sports protection for athletes. Shock Doctor Boy’s Power Compression Short with BioFlex Cup (Youth). All its features are exactly like the Men’s version, and the difference is only in the sizing. All the advantages of the bigger version are here as well. The material (86% Polyester, 11% Spandex, 3% Nylon) is the same too. Also remember that the cup is detachable. It’s not permanently attached to the shorts. And please remember to use some common sense when you wear this. One Amazon review lauded its comfort and fit, but complained at length about its strange design and how the cup was located outside the shorts. He also related how when he slid it predictably didn’t protect the “boys” from getting a bit dinged up. He didn’t quite think that maybe he was wearing the shorts inside-out! 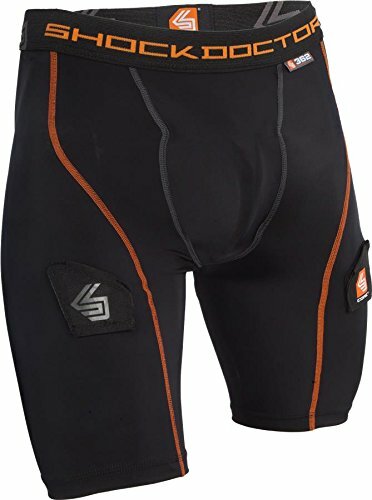 Easton Extra Protective Sliding Short. Now if you want some protection that’s a bit better, this Easton may do the job. That’s because the material (90% Polyester and 10% Spandex) includes 5mm of neoprene for sliding areas. It also keeps you dry because the “Bio-Dri” fabric wicks away the moisture. Its price is also quite reasonable and it’s not as expensive as the Shock Doctor. Unfortunately, there are only 4 sizes available, unlike Shock Doctor that offers 4 sizes for teens and then another 7 different sizes for men. Another problem with the Easton is that it doesn’t hold a cup all that well. Most guys like it well enough as sliding shorts, but you need another solution for your cup and cup holder. Louisville Slugger Men’s Slugger Gold Shield Sliding Shorts. Louisville Slugger is an iconic name in baseball, so for brand recognition alone this is great. But this pair of sliding shorts doesn’t just rely on the fame of the brand to sell. The material (90% Polyester and 10% Spandex) is very comfy, and sweat is handled by the “X-Dry” moisture management system. For sliding protection, you also get the high impact deluxe pad to keep you from bruises and abrasions. This one comes in an 8-inch inseam, and there are 4 sizes to choose from. And it doesn’t come with a cup, as you need to buy one separately. 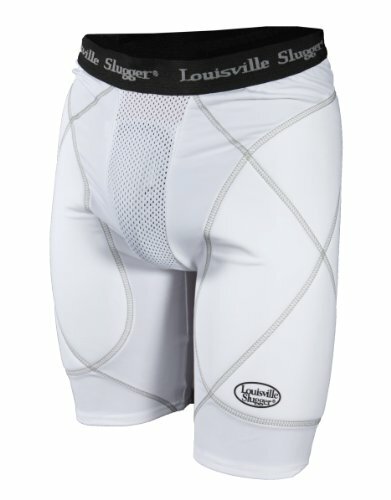 With these Louisville Slugger shorts, you only get a cup pocket designed to hold the cup. Any of these shorts are excellent as long as you make sure you get the right fit so everything is snug and comfy. Wear a pair of sliding shorts with cup every time, and you can be more confident when you slide to home plate!